Isn’t it ironic that I’ve been meaning to blog about information overload since last Wednesday and that I haven’t been able to get to it because of, well, information overload?! The sheer amount of call-to-action emails I received last week alone would make any IT department head’s spin. Prioritization is indeed an important skill. Even as things are swirling about us, we need to be able to say, “I will get to this on Monday.” Expectation management, prioritization’s close cousin, reminds us (and those around us) that there truly are limits to what we are capable of doing at any given moment. 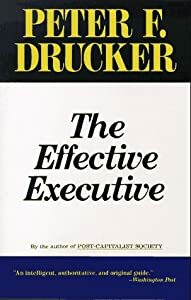 According to Peter Drucker’s 1967 classic, The Effective Executive, “most of the tasks of the executive require, for minimum effectiveness, a fairly large quantum of time.” We all need time to process, think and consider our next action steps. Yet so often we are in reaction to our environment (phones ringing, emails pinging, Skype singing) that we barely have a moment to tend to the higher thinking required in our jobs. I was recently advised by colleagues to become more strategic in my thinking. Looking at the Big Picture can save baby steps that lead us down the wrong path. I agree. And the greatest challenge is finding the time to be in proactive, not reactive, mode. We have to train ourselves not to pick up the phone, to let it go to voicemail or to respond only to those immediate matters that are of utmost importance. We risk disappointing people who expect you to jump when they want you (Oddly, I have easily taught my children that their ‘now’ is not always mine. Defining the when of things is key). I pondered the ‘always on’ syndrome as I finished up some mindless administrative work that merely required concentration and an uninterrupted ninety minutes on Saturday. Yes, Saturday! I weighed my options. Was this urgent? (It was). Was it important? (It was). Would I suffer more by delaying the task until Monday? (Most definitely). The McKinsey Quarterly ran a great article entitled “Recovering from Information Overload” that points to our collective split-screen dilemma of attention fragmentation and overlapping commitments. As things unfold in real-time and people expect you to follow their string of emails like the crawl on the bottom of a TV screen, we are literally information-saturated. Multitasking kills productivity. Pruning your email inbox may feel like you’re doing something, but interrupting yourself from one thing to the next slows you down. It hampers creativity, makes you anxious and has addictive qualities. The next time you’re tempted to answer emails while on a Skype call, know the other people can hear you thumping on your keyboard while you pretend to listen. Focus, filter, forget. To deal with your data deluge, unplug, delegate and engage in physical excursion. Some executives in the McKinsey article claimed some of their most brilliant ideas came in the midst of a headstand in their yoga class. Little known fact: our human evolution has stayed roughly the same for the last 150,000 years. Your typical desktop computer changes every few months. Compared to our human reaction time, that old PC in your home office reacts 750,000,000 times faster than you. Yet we still try to increase the speed with which we respond. It used to be we just wanted to keep up with the Joneses. Now we’re trying to keep up with our gadgets! To master my email flow, for instance, I’ve taken the challenge. In fact, I have had a modicum of success. This week I’ve spanked my inbox into one monitor length. And it’s going to stay that way if it kills me. And it might. Despite a grueling travel schedule that took me from Bethesda, Maryland to Charlottesville, Virginia, I have been able to manage my email influx. Perhaps it has to do with the fact that I met with a lot of people in person with whom I normally correspond via email on a daily basis. Or perhaps it is because I have not been accessing my email as readily as I usually do. Email is like a virus. It just keeps spreading. The more you write them, the more you receive them, or so it seems. While I am psyched to hear from that reporter or this one, I am not so enthralled with the spam, baby item giveaways that can only be sent within the lower forty-eight (I live in Germany) or other PR outreach that means I have to stop what I’m doing to pay attention to something else that most often serves only as a distraction. Our hyperconnection is a blessing and a curse. It’s all about the filters you’ve put in place. 1. Designate times for information gathering. You don’t need to check your email every five minutes. 2. Use your tools. Autoreply is an often underutilized function that helps manage people’s expectations while you liberate your sfocus for what’s truly important. 3. Stop apologizing. If we think responding within 24 hours is unreasonable and we tag each email with an “I’m sorry for the delay!”, we’re teaching people how to treat us. Read: we allow them free license to expect anything sooner. The truth is email is an information delivery system, like anything else. Just because it is instantaneous doesn’t mean we have to be. My dear friend Guy sent me a link to a story on InternetNews the other day. It addressed the spate of suicides and suicide attempts at France Telecom (a key brand of Orange) in the last year (22 with 13 attempts). The CFO of the company, Gervais Pellissier, admitted that 24/7 connectivity, thanks to contemporary hand-held devices, has increased employee stress levels exponentially. The very telecommunications industry that spawned our hyperconnectivity is the very one to meet its own demise. “When you were an average employee in a big corporation 15 years ago, you had no mobile phone or no PC at home. When you were back home, work was out,” he said. Work was out. Done. Finished. And now people are finishing themselves off as they realize twenty-four hours a day is not enough. Somewhere along the line, people forgot that every business is comprised of people, not just machines. I claim we have an abundance of time, but we need the heads of corporations, such as France Telecom, to realize there is also a limit to our availability. Just because I have 24 hours a day doesn’t mean the company owns it all. Ironically, France has the most vacation days in the world. Yet people are ill-equipped to handle the expectations our 24/7 world has placed upon them. We need to return to a state of civility and normalcy in which our time-off is our own. Just because we can answer the phone at midnight doesn’t mean we have to. I plead for more sanity in our workplace.